DUBLIN (Reuters) — Irish recruiters are already filling jobs for financial services firms which are shifting some operations from the United Kingdom, with Dublin moving fast to steal a march on rivals just a month after Britons voted to leave the European Union. While France has begun courting bankers with new tax breaks for expatriates and Frankfurt, Amsterdam and Luxembourg are also making pitches, Ireland is presenting itself as the only English-speaking country that offers a base in the euro zone and a future in the EU. Before the June 23 referendum, the government warned that a departure of Ireland's nearest and biggest trade partner from the EU would pose "a major strategic risk", with exporters to Britain particularly worried. But Brexit also presents opportunities for Ireland, which has decades of experience in attracting multinational investment, and it is determined to seize them. Ireland is already one of the world's largest centres for "back office" banking functions such as settling transactions, many of them farmed out from London - Europe's financial capital but whose future outside the EU is beset by uncertainty. On top of that, Ireland hosts a growing financial technology industry. Some headhunters say it's too early to spot any definite trend. Nevertheless, Dublin-based Sigmar Recruitment is more than doubling its own workforce, hiring 150 extra staff over the next two years to handle foreign demand that was already increasing before the referendum and has accelerated since. "We have two particular projects relocating from the UK and then maybe another three that were considering two to three locations across Europe ... and those have all gone in Ireland's favour," said Robert Mac Giolla Phadraig, Sigmar's Chief Commercial Officer. "The headcounts for some of the projects are anywhere between 50 and 200." He told Reuters that Sigma now has to find candidates for a total of 1,500 to 2,500 positions, mainly from U.S. and European firms. The jobs are in many areas including internal departments that ensure firms are complying with regulatory rules on managing their financial risk, as well as financial technology and IT support. A major opportunity for Ireland is the risk to London-based operations if Britain loses access to the EU's "passporting" arrangement, which allows businesses regulated in member states to sell financial services across Europe. Beazley Plc, which manages six Lloyd's of London syndicates, said last week it was working to get European insurance licences for its Irish reinsurance business. British asset manager M&G Investments, the fund arm of insurer Prudential, is also looking at expanding its operations in Dublin. Brightwater, another specialist Irish financial recruiter, has got go-aheads from bigger companies, mostly banks, for jobs in the "low hundreds" moving from Britain, according to head of marketing Eileen Moloney. Other firms are at an earlier stage of planning, such as DueDil, a financial technology startup employing just under 100 people in London that was looking at expanding into Europe regardless of the referendum result. 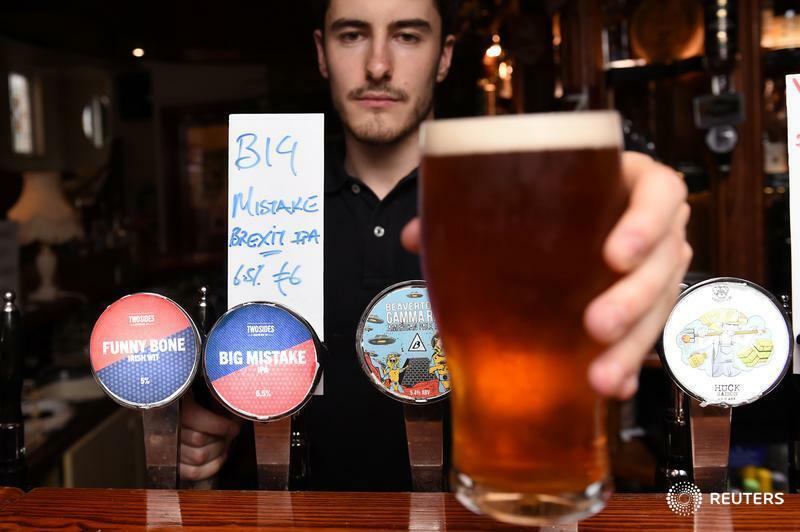 "What Brexit does is it makes us re-evaluate the distribution and types of teams we would be hiring," co-founder and chief executive officer Damian Kimmelman told Reuters. Kimmelman gave inside sales - those made over the phone or online rather than face-to-face with clients - as an example. "Should we hire our inside sales (team) in the UK or should we hire them in Ireland? Ireland's always been attractive as a hub for inside sales, but it becomes even more attractive now than it was before," he said, adding that his firm could be employing 20 people in the country within a year. The pick up in Ireland has coincided with flagging recruitment in Britain even before the referendum, due to uncertainty over its outcome. British recruiter Hays said net fees in the UK and Ireland fell 4 percent on a like-for-like basis in the quarter to end-June, but taken alone, fees in Ireland grew 22 percent. Randstad, the world's second largest employment services company, has seen a low level of hiring in the British financial sector, its CFO told Reuters. The state agency in charge of attracting foreign direct investment (FDI) to Ireland reports similar trends to the recruiters. "From our end, Brexit is coming up in all our discussions with clients and potential clients," said Martin Shanahan, the chief executive of IDA Ireland which reported a pick up in jobs in the first half of the year following record growth in 2015. "The most significant increase is in financial services. We've seen a major increase in traffic into Ireland over the past number of weeks across all areas - banking, insurance, funds and payments - wanting to talk to us about possibilities." Shanahan, who oversees a strategy responsible for around 190,000 jobs or almost one in every 10 Irish workers, also sees opportunities in the technology and pharmaceutical sectors and expects it will be well into next year before the full impact becomes apparent. Companies hunting for the right talent in Ireland, where unemployment has halved to 7.8 per cent since 2012 amid a sharp economic recovery, will still have abundant choice, if initial inquiries are anything to go by. Recruiters say they've seen big jumps in British-based candidates seeking Irish positions since the referendum. Some are Irish looking to return home, but others are Europeans and Britons who now consider Ireland a more stable place to work. Job website Indeed.com says searches for Irish positions made from Britain were 2.5 times higher in the days after the vote than the average before, and have remained at a high level. Ireland also appeals to companies due to its easy access to the United States. Joe Bollard, head of International Tax Services for EY in Ireland, said he is aware of one new FDI investor that has already gone back to its board to reconsider a decision to base its European headquarters in Britain. The company was starting the process of hiring, leading to several hundred jobs long term. Although a large number may still go to Britain, Bollard said Ireland is the most likely credible alternative because of its record in the sector involved. "It's a trickle rather than a torrent at this early stage but this does create a real medium term window of opportunity for Ireland," said Bollard.